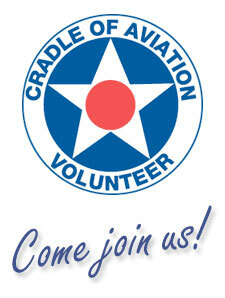 The Cradle of Aviation is looking for men and women who wish to volunteer a few hours of their time each week. The atmosphere is interesting and exciting and you will meet and work with community spirited people who share a love of aviation, Long Island history and friendship. We provide annual training and welcome individuals who are comfortable and enthusiastic about working with people. Our team of volunteers is the pride of the Cradle of Aviation and you can become a part of this exciting family. COME JOIN US, and share in the satisfaction! Share information with visitors. You do not have to be knowledgeable about aviation to make an impact here. Our large number of docents are passionate, committed and eager to assist newcomers. Our restoration members build aircraft parts and replica planes for exhibit. If you like to be creative and work with your hands, this might be the place for you. These volunteers are immensely proud of what they build. School Groups – the museum presents a variety of programs about aviation, space exploration and Long Island’s heritage of discovery to visiting school groups. Public Programs – we offer family activities on weekends and holidays, as well as camps during the summer and vacation breaks. Special Interests – the museum presents scout programs and special events for those seeking an in-depth look at a particular activity, exhibition or collection. Outreach Programs – museum representatives travel to schools, libraries and community groups to make presentations of its programs. Qualifications: Good public speaking skills. Enthusiastic and energetic. Experience in teaching or interacting with the general public preferred. The Museum Gift Shop Volunteer would be trained as a cashier, restocking, dusting, cleaning, and keeping shelves organized/presentable. There would be lifting of small boxes, light objects such as toys etc. The Theater Monitor helps to keep a clean and orderly environment in the museum’s Jet Blue Sky Theater Planetarium; checking in guests prior to each show and helping guests exit safely. The Information Monitor will help direct visitors and answer general questions about the Cradle of Aviation Museum facilities, resources and services in the surrounding area and associated organizations. The Junior Jet Club Attendant will have the opportunity to help inspire some of our youngest visitors; Families with children ages 2-6yrs old frequent our Junior Jet Club. This volunteer will help to keep a fun, clean and safe environment for little tikes to explore books, toys and exhibits in the space. Please contact us via form below.